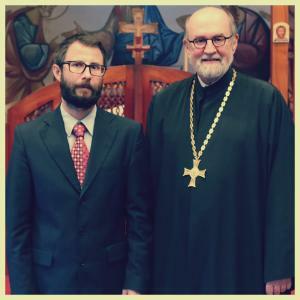 Yonkers, NY [July 20, 2018] – St. Vladimir’s Orthodox Theological Seminary (SVOTS) has appointed Dr. Ionuţ-Alexandru Tudorie to the position of academic dean. The Seminary’s Board of Trustees selected Tudorie, a native of Romania, on July 18 after the Academic Dean Search Committee had narrowed down the list of possible candidates to two. The announcement concludes an extended and carefully-undertaken search process that began at the start of the 2017-2018 academic year. Dr. Tudorie has most recently served as professor of Byzantine History and Medieval Church History at the University of Bucharest. 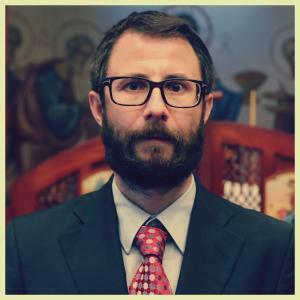 He brings expertise in Church History, Byzantine Studies, and Patristics to SVOTS in addition to proficiency in multiple languages. Dr. Tudorie, 41, is a member in good standing of the Romanian Orthodox Church. He holds doctorates in both Theology and History from the University of Bucharest. Additionally, he has been the director of two advanced research projects and has served as secretary of his department and member of the Commission for Quality Education at the University of Bucharest. His research has received financial and intellectual support from prestigious international institutions including the Netherlands Institute for Advanced Study, Dumbarton Oaks Library and Collection, New Europe College, Woodrow Wilson International Center for Scholars, Romanian Academy, National Council for Scientific Research, and Institute for Research in Humanities (University of Bucharest). He comes to SVOTS highly recommended by scholars at Dumbarton Oaks. His publications and scholarly works include Imperial Authority in Crisis: Michael VIII Palaiologos (1258-1282) and the Relations between the Byzantine State and the Church (in Romanian, 2016); “Et tenentes frenum equi ipsius: A new approach to the 13th-century relationship between the Byzantine emperor and patriarch”(The Patriarchate of Constantinople in Context and Comparison, Verlag der Österreichischen Akademie der Wissenschaften, 2017); Le patriarche Athanase Ier (1289-1293 ; 1303-1309) et les arsénites: une lettre patriarcale contre les schismatiques (Le Patriarcat Oecuménique de Constantinople et Byzance hors-frontières (1204-1586). Actes de la table ronde organisée dans le cadre du 22e Congrès International des Études Byzantines, Sofia, 22-27 août 2011, Centre d’études byzantines, néo-helléniques et sud-est européennes / École des Hautes Études en Sciences Sociales, 2014); and an introductory study and chronological overview for a bilingual edition of Photios of Constantinople’s Mystagogy of the Holy Spirit (Polirom Publishing House, 2013). The official search for a new academic dean of the seminary began in the fall of 2017. 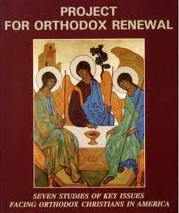 A search committee was formed, chaired by His Beatitude, The Most Blessed Tikhon, archbishop of Washington and metropolitan of All America and Canada (Orthodox Church in America). 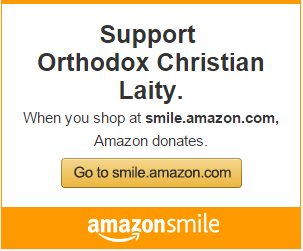 The committee also consisted of Archpriest Chad Hatfield, Archpriest Philip LeMasters, Archpriest David Barr, and Dr. Frank Cerra from the Board of Trustees and SVOTS faculty members Archpriest Alexander Rentel and Archpriest Sergius Halvorsen. Trustee Dr. Melody M. Thompson served as a consultant on the committee. The Search Committee was tasked with finding a visionary and inspiring academic dean with the skills, energy, and experience to advance the academic mission and current programs of the Seminary as well as to develop new programs to meet the needs of the Church and the world in the twenty-first century. The Board of Trustees considered numerous factors and several candidates during the process that began with the original Search Committee’s work. In May of 2018, the Search Committee presented two final candidates, including Dr. Tudorie, to the full Board of Trustees for consideration. A desire for further careful reflection and discussion extended the search process to July, when extensive, full-day interviews of both candidates were carried out before deliberations and a final decision. Dr. Tudorie becomes the first academic dean of SVOTS under the Seminary’s new governance model, which was adopted in 2016. The position differs from the defined role of the Seminary dean prior to the new governance model. The academic dean will serve as the chief academic officer, whose primary responsibilities are to lead and supervise the faculty and to oversee all academic activities of the seminary, under the supervision of the seminary’s president. The academic dean is appointed by the Board of Trustees and reports directly to the president.